We know that conflict will happen in the Church. As members of the Body, we have a responsibility whether or not we are a part of that conflict. Remember, as discussed in a previous post, we are members of one another. That means what affects one member affects all. The beginning of Romans 12 talks about how we are members of one another in the Body. It then lists a number of commands about how we are to relate with one another including being devoted to one another and living in harmony with one another. Verse 18 zeroes in on the responsibility of individual members of the Body for this to happen saying, “If it is possible, as far as it depends on you, live at peace with everyone” (Rom. 12:18). It doesn’t matter who we are, or what position we hold, we are all to “be like-minded, be sympathetic, love one another, be compassionate and humble” (1 Pet. 3:8). 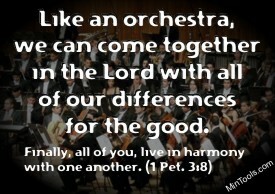 As the NASB words it, “all of you be harmonious” meaning each individual one of us have a responsibility to do our part to live in harmony with one another. To Read: Let All Be Harmonious – How’s that going to happen? Leaders: These verses include you too! But, you have an even greater responsibility as shepherds to be “examples to the flock” (1 Pet. 5:2-3). Clearly we can see that we have a personal accountability for how we deal with conflict. But, what about conflict within the Church that has nothing to do with us? Should we ignore it? Take sides? Pray for them? Or, help them? Perhaps the conflict situation in the church of Philippi between two of its women will help us. The Apostle Paul wasn’t even physically present but having heard of this conflict was so concerned about it that he “pleaded” with the women to reconcile. But he didn’t stop there, He asked someone else to “help these women” since they were all members of one another and participants together in the cause of the gospel. Too much was at stake to let this conflict fester. Notice that Paul exhorted them to “be of the same mind in the Lord” not that they had to agree with each other. Leaders: You might not always be the one to directly bring resolution to conflict within the church but you do have a responsibility to guide the process. When you are the one to help, guard against taking sides. Help people find their commonality and fellowship in the Lord as members of one another. If necessary, help them learn to agree to disagree on certain issues, to extend forgiveness and acceptance, for the sake of Christ, in His name, for His glory, because of Him.